The Bible is a big book written in a different culture and often with pretty convoluted sentences. I can see why it’s intimidating to many believers. The good news is: It doesn’t have to be. Encourage someone with these 4 truths, and see them get started reading and loving Scripture. Nobody masters the Bible overnight. It’s a long book that takes a while to read, let alone study. That’s ok. Our commitment to Christ is long-term, so we are also committed to learning about Him for the rest of our lives. You don’t need to be a Bible expert tomorrow. Invest a little time every day, and after a while you will understand more, be encouraged by deep truth about our God, and challenged to change your heart and life to look more like His. I hear from many ladies who are hung up by the question of where to start. While there are a few strategic ways to go about tackling the Bible, don’t let the search for the correct approach stop you from reading at all. Start in the beginning with Genesis. Start with Christ in one of the gospels (Matthew, Mark, Luke, and John). Start with practical life advice from one of the epistles such was James or Ephesians. Start with wisdom from the book of Proverbs, reading the chapter that corresponds with each day’s date. You may not feel like you have a full grasp of Scripture yet, but you can still learn from the Bible in the meantime. Let it speak into your life. Let it encourage you. Reading the Bible is not a dreaded chore or legalistic ritual. Enjoy the process. Always remember not to compare your beginnings with someone else’s middle. God delights in your efforts to learn from His Word, and you can delight in it as well. We are not alone in this endeavor. God wants us to learn from His Word. He is in the business of not only bringing us to faith in Him but refining that faith until we meet Him in glory. The Holy Spirit is by your side and will grant understanding. Praise Him for that! You wouldn’t pick up any other book, read a few sentences from a random page, and except to understand them. Yet, that’s how many believers read the Bible. Some may mistakenly believe that the Bible does not have one cohesive storyline but rather is a seemingly random collection of stories. The truth is, the Bible does have a storyline. Understanding it will allow you to put any passage into the right context. It will do wonders to anyone’s confidence as they approach the Bible. 2. Learn valuable Bible study methods. I am glad that the ladies in your life are expressing a level of reverence when it comes to studying Scripture. It’s important to be a good steward of God’s Word. That doesn’t mean we have to be afraid to approach it. Teach your group the three-step process of Bible study: Observation, Interpretation, and Application. You may need to break down each step into bite-sized tips to make this method more approachable. They make observations by asking basic questions, studying words and phrases, and checking out the context. They identify what needs interpretation and make decisions based on their observations and findings of other scholars. They seek to apply the truth they learn to their lives. Any believer can learn this process. I highly encourage any woman - whether a new believer or seasoned reader - to become familiar with this study process and allow it to transform their time in God’s Word. Show them this blog and how to sign up for the “Mini-tip Monday” articles. They will learn Bible study tips in bite-sized portions, perfect for growing one’s Bible study ability without getting overwhelmed. Encourage them to head over to scriptureconfidentliving.com/10-steps to sign up for the FREE ebook, 10 Steps to Approaching the Bible with Confidence. This pdf guide has helped hundreds of women take the first or next step on their Bible study journey. Consider the Scripture Confident through the Bible for your next small group curriculum. This online course breaks down the “observation, interpretation, application” Bible study method into manageable pieces while giving you an overview of the Bible's storyline. It's set up with lots of resources to study through the course in community. Studying the Bible doesn’t have to be complicated. Watch your small group go from confused about the Bible to approaching it confidently. How can you help them get there? Do it with lots of prayer and the Scripture Confident through the Bible series. Try out the first three weeks for FREE here. Bible teachers, I’d love to hear from you! 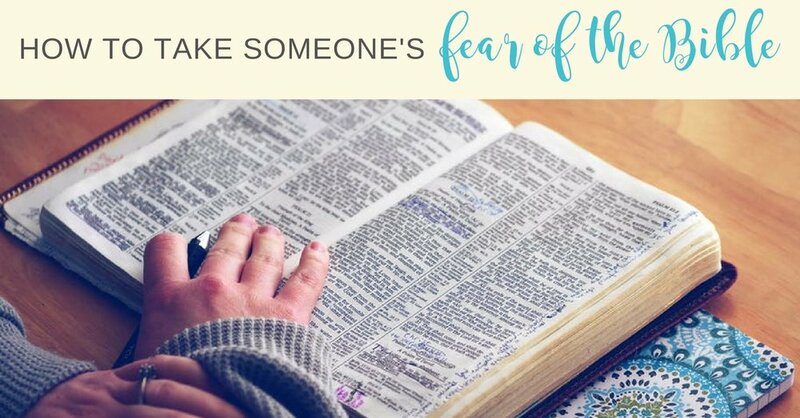 What fears about the Bible do the women in your group express? What’s keeping them from approaching this amazing Book confidently? Share with us in the comments below. Let’s pray for one another and the ladies in our lives that God would break down barriers and allow all these women, whom we love so dearly, to learn from His Word. New to the Faith? Start here.